Kate and Oli: Painting Party With Wine And Canvas! Painting Party With Wine And Canvas! 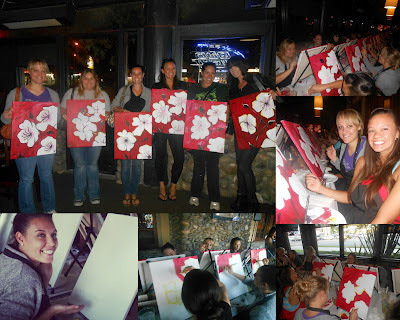 Last week, my girlfriends and I went to a Wine and Canvas event - I know, sounds good already, right? 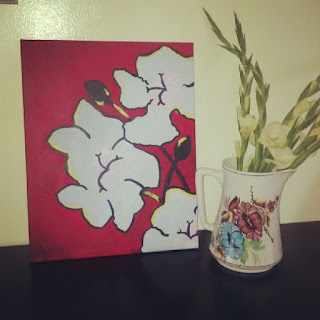 :) We met at a local restuarant (in our case, Tony Roma's) and were given a step-by-step painting lesson! There was a special happy hour menu available for us to order from - we noshed on delicious garlic bread, bbq bites, and of course, wine! It was SO much fun and really re-awakened some creative juices that I thought were long gone. We've even talked about setting up our own classes in one of our homes! We used a Groupon to sign up for our deals, but you can go straight to the Wine and Canvas website - there are locations all around the country! Dude, those look lovely lovely lovely. Wow! That looks great and it looks like it was a really fun time!! 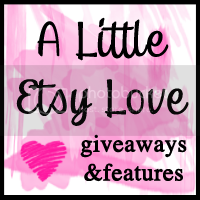 New Handmade Cards By Kate & Oli On Etsy! Cart-Worthy + Heart-Worthy: Fruit and Veggies! I Am My Car? I Am Not My Car? Happy Wedding Day To My Little Sis!